NSUN played an instrumental role in writing documentation which is part of the Department of Health's 'Social Work for Better Mental Health' programme and guidance. One of the documents released by the DoH include the 4Pi National Involvement Standards as framework for co-production in mental health social work. this page, which has links to all documents concerned, will tell you more. This weeks blog is about the superhuman skills needed to negotiate the UK Welfare System. Author Peter Beresford is professor of citizen participation at the University of Essex and emeritus professor of social policy at Brunel University. He is chair of Shaping Our Lives, the national disabled people's and service users' organisation and network. Don't forget the Newcastle Mental Health day. Together with Launchpad, Time to Change, North East together (NEt) and many more. Saturday 6th February 10am-3pm around Grey’s Monument in Newcastle. If you're interested in volunteering on the day contact Angela Slater. The Court of Appeals has ruled that the so-called bedroom tax discriminates against a domestic violence victim and the family of a disabled teenager. Recovery Devon have a development fund which offers financial support to individuals or organisations for projects, events or research based around Recovery. If you have an idea which can help your local club or community, an artistic project, or an activity which meets a genuine need, then Recovery Devon wants to hear from you. Your idea will need to have its roots in Recovery and the projects must take place between March and August 2016. The University of Hertfordshire has just launched a new scholarship for one of its successful online Master’s courses, in Mental Health Recovery and Social Inclusion, a course produced by, and developed for mental health professionals and service users. The University has decided to take its commitment to service user involvement further by supporting a free place on the MSc Mental Health Recovery and Social Inclusion (online), specifically for a person with lived experience that wishes to start studying in September 2016. On 5 October 2015 a half day training event was held for 93 locally recruited community champions from the community and voluntary sector, health services, front line support services and members of the public. This event was supported by the North West Time To Change lead, the National Time to Change Team and St.Helens Public Health Team. This led to the publication of a useful report for anyone, but particularly for influencing local authorities to get people talking to challenge the stigma and discrimination in mental health. The aim of this localised programme was to changepublic perception of mental health by encouraging community members to spread healthy mental healthmessages to friends, family, colleagues and service users. Playwright and performance poet Karis Halsall (MEGAPOLITAN, Little Stitches) joins forces with ‘All in’ director Stephen Sobal (Love Sick, Treading Water) to bring you the VAULT previews of HYSTERICAL. Set between a frantic advertising agency and an inpatient facility; June, a virgin clown and her associates attempt to rebrand water, wellness and 'madness' and Madonna. Co-produced by HOAX (AUS/CAN/UK) and Luminary Theatre (UK) in collaboration with UCL. A revolution is needed to tackle the coiuntry's mental health crisis, says Guardian columnist. Also concerned about the deepening crisis, Mental Health Today warned that further cuts to housing benefits could leave vulnerable people with no means to pay their rent. The Daily Mirror also reported on the country's mental health crisis, with an article on Britain's top psychiatrists warning about Tory benefit cuts are making mental health conditions worse. The University of Buckingham's vice-chancellor considered tackling the crisis by sharing tips for students and university staff. A national conference on overcoming current challenges for professionals. Book before 15 February 2016 to take advantage of early bird rates and save £50 on a booking cot of £145. The Francis Report, the Keogh Report, the Jasmine Report, the Berwick Review, the Bubb Report – and most recently the Homes not hospitals programme have promised to improve the care for vulnerable adults in residential settings. 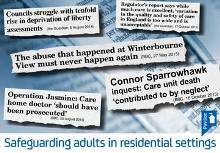 But are policy changes sufficient to halt the abuse and neglect of vulnerable adults in residential settings amidst a backdrop of austerity and increasing scrutiny? And more importantly, are we really learning the lessons from history and previous tragedies? This national event will look at overcoming current challenges for professionals who work to support vulnerable adults in residential settings. To read more about the event and book your place, please visit this page. Do you want to improve your health? Maybe you would like to be more active, eat more healthily, quit smoking or drink less, but you’re not sure where to start? We can help you make a real difference to your health and wellbeing. Checks and tailored one-to-one support to help you identify the changes that could improve your health and wellbeing. The Healthy London Partnership's Personalisation & Participation programme is looking to recruit around members of the public to contribute to the design of a prototype personal health budget application. A session will be held from 11am to 4pm on Friday 26 February at NCVO, Society Building, 8 All Saints Street. London. N1 9R. Please note that we have been informed that there are only 6 places left on this as of 31 january 2016. This briefing paper provides further information. The programme is particularly interested in recruiting individuals, family members and carers who are interested in accessing or are already recipients of personal health budgets provided by their local CCG, personal social care budgets provided by their local authority or a joint health and social care package.